Hotel ibis budget Stuttgart City Nord. Book now! Free Wifi! 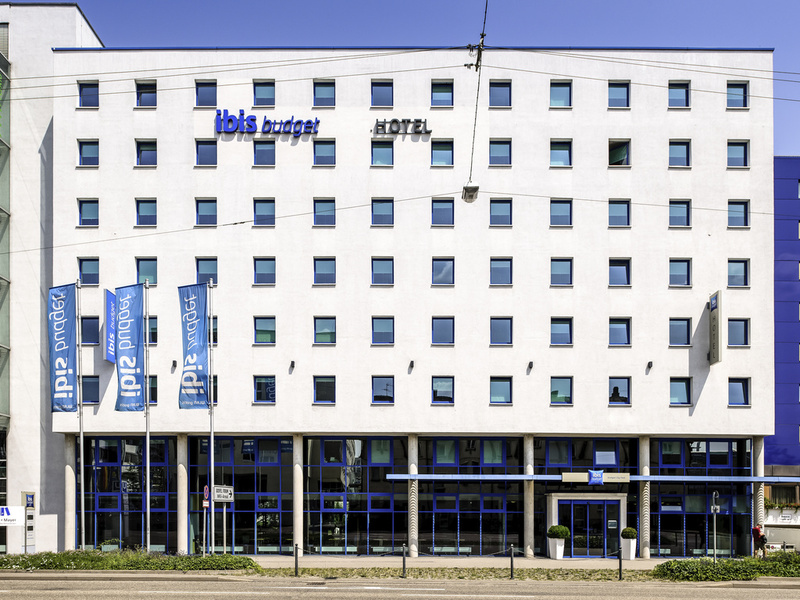 The ibis budget Stuttgart City Nord is located in the Feuerbach business district and close to Killesbergpark. The Maybachstrasse subway station is right on our doorstep. The 1-star superior hotel impresses not only with its location, but also its modern rooms with free WIFI access and a delicious buffet breakfast. The hotel is just 4 km (2.5 miles) from the city center. The subway station is right in front of the hotel. The hotel has a parking garage with direct access to the rooms and reception. Our staff are available 24 hours a day. It was acceptable. We were only in the room to sleep. It would have been unacceptable if we’d wanted more. Clean. However there was no hot water on the Monday morning and that was awful. A camping fork, which I used to have dinner, was taken by the room service. After discovering this when I came back at the evening, I let the reception know about this. He said, I should come to see him the following day. I did that. He said he forgot and I should ask his colleague the next morning when I'm checking out. I explained the situation to his colleague. The colleague asked the head of room service. The head of room service said it is impossible since the room service is not allowed to take anything. I believe the room service mistakenly judged the fork as a one time use plastic fork. However the end of the story is that the reception told me they can't help me. Very unpleasant. It is not like I'm asking for a notebook. It is a 10 Euro camping fork. These things can happen. Would have been satisfied to receive free parking or something. But just saying they can't help me and that's that is not very customer friendly. Pros: -The location is good; it is located exactly one step of the U Bahn station. Cons: -Even though it's a non-smoking hostel, the hallway is still full of nasty smell of cigarettes. -The room and bathroom are both very small. -Wrote to the hotel during the booking but get no replies. Room like a camping Van, Window which doesn´t work (broken opening mechanism), no hair dryer in the room (only on reception for 10€ caution). Friendly staff. My Overall experience was good and worth to the payment. I drove over a weekend to Stuttgart with a car. The location of the hotel is very good, for both downtown and north Stuttgart. The rooms have good size, while the breakfast for € 7,50 per person is unbeatable. A parking place in the hotel's garage costs €8 per day. For the money, a very good value, keep it that way! Staff - excellent; food - very good; lift - a little too slow. Room - of the interesting design and nicely optimized facility, as expected for budget type of a hotel; it is also clean and quiet; absence of a hanger for the towels near the washbowl and shower is a drawback as are the unsteady legs of the bed. I also missed a small after shower flor towel. Hello, I recently had a short stay at your hotel. The experience was good, the check-in, check-out was fast. The room had all the basic essentials which were required for my stay. So, full marks to that. Location wise this is very convenient, since it is so close to Maybachstrasse U-Bahn station. The breakfast spread could have been better, since I stayed at IBIS Budget Zurich Airport at around the same time and they had a bigger spread. I stayed there for 2 days and for those 2 days, out of the 2 lifts there, 1 was constantly closed. This resulted in a longer wait time for me while ascending or descending. Since my room was on the 4th floor, stairs was not an option for me as a backup. The staff was helpful and polite. Overall, a good stay. I usually use IBIS for my business trips in Stuttgart because it is very well situated, closed to underground (U Bahn). Building is new and clean. It offers suitable place for parking. All services are for suitable price. Can't beat the proximity to the UBahn station and a great breakfast! It was good with pleasant staff and like most Ibis properties I stayed at. The updated room was great. But, the shade for the one window in my room needs repair. The post that the pull down is supposed to mount to is stripped and can't be screwed into the wall. In fact, it fell out of the wall twice in my hand. Luckily, it still worked when I put it back in. This would have been bad if it didn't work because the window can be directly looked into by people on the same floor leaving the elevator and walking to their rooms. Check in the hotel was 2019-Feb-11 and check out 15. After my first night I went to work and when I came back in the afternoon entered into my room and realized that the room hadn't been cleaned. Went down to the lobby and spoke with the receptionist and she only told &quot;I can give you a towell&quot; and took a note of my room number. There were some people in the lobby, I am a polite person and don't want to make a big mess but this is not ok. Is not a good experience because one of the reason why I choose a hotel and not another kind of service is because of the room cleaning. Additionally one day in the breakfast the orange juice machine was broken, of course I understand that this can happen but it didn't helped to improve the experience. But what bothers me the most is not receiving a single word, apology, or action to compensante my problema, just a towell.